2 of 4 Season pork chops with 1/4 teaspoon salt and 1/8 teaspoon pepper. In a large skillet, heat oil over medium-high heat. Add chops; cook until lightly browned, about 2 minutes per side. Remove skillet from heat. 3 of 4 Coat 2-1/2-quart oval baking dish with nonstick cooking spray. Add rice, tomatoes, 1 cup water and remaining salt and pepper; stir to combine. 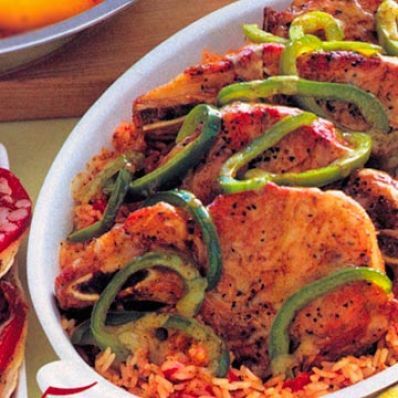 Place pork chops on rice mixture; scatter green pepper over top. Cover dish with foil. 4 of 4 Bake in 350 degree F oven for 50 minutes or until rice is tender and most liquid has been absorbed. Remove foil from dish; sprinkle cheese over top. Bake until cheese melts, about 5 minutes. Let stand 10 minutes before serving. Makes 4 servings. Per Serving: 35 g pro., 39 g carb., 508 kcal cal., 1034 mg sodium, 3 g fiber, 8 g sat. fat, 23 g Fat, total, 87 mg chol.